Headley Grange, Hampshire, with the Rolling Stones Mobile Studio. Led Zeppelin III is the third album by English rock band Led Zeppelin. It was recorded between January and July 1970 and was released on 5 October 1970 by Atlantic Records. Composed largely at a remote cottage in Wales known as Bron-Yr-Aur, this work represented a maturing of the band's music towards a greater emphasis on folk and acoustic sounds. This surprised many fans and critics, and upon its release the album received rather indifferent reviews. Although it is not one of the highest sellers in Led Zeppelin's catalog, Led Zeppelin III is now generally acknowledged as representing an important milestone in the band's history. After preparing the material that would emerge on the album, Page and Plant were joined by the other members of the band (drummer John Bonham and bass player John Paul Jones) at Headley Grange, a historic mansion in East Hampshire, to rehearse the songs. With its relaxed atmosphere and rural surroundings, Headley Grange appealed to the band as the favoured alternative to the discipline of a conventional studio. By mid-May, the band were ready to record the songs for their third album, Led Zeppelin III. The album was then recorded in a series of sessions in May and June 1970 at both Headley Grange and at Olympic Studios, London. Some additional work was put in at Island Records' new Basing Street Studios in Notting Hill, London, in July, then mixed at Ardent Studios, Memphis in August 1970 during Led Zeppelin's sixth American concert tour. The album was produced by Page and engineered by Andy Johns and Terry Manning. The album contains two songs which became key components of the band's live concert performances for many years: 'Immigrant Song' and 'Since I've Been Loving You'. The first of these, written by Jimmy Page and Robert Plant, is about the Norse invasions of England and was inspired by the band's recent live performance in Iceland. 'Since I've Been Loving You' is a classic, original blues in the key of C minor featuring heartfelt interplay by all four group members. It would become a live performance staple for the band, especially from 1971 through 1973, replacing the slow blues of 'I Can't Quit You Baby' from the first album as the band's slow blues showcase. The album also featured the rock songs 'Celebration Day' and 'Out on the Tiles', the eastern-influenced 'Friends' and the acoustic tracks 'Bron-Y-Aur Stomp', 'Tangerine' and 'That's the Way', the latter considered by Page to be a breakthrough for still-developing lyric writer Plant. The album concludes with 'Hats Off to (Roy) Harper', a track dedicated to their influential contemporary and friend, Roy Harper, honouring Harper’s work and acknowledging the band’s roots in acoustic music. Led Zeppelin III was one of the most eagerly awaited albums of 1970, and advance orders in the United States alone were close to a million mark. Its release was trailered by a full page advertisement taken out in Melody Maker magazine at the end of September, which simply said 'Thank you for making us the world's number one band.' The album was released on 5 October 1970 in the United States and 23 October 1970 in the United Kingdom. Led Zeppelin III was a trans-Atlantic number one hit. It spent four weeks at the top of the Billboard chart, while it entered that British chart at number one and remained there for three weeks (returning to the top for a further week on 12 December). In spite of its initially mixed reviews and lower sales than Led Zeppelin's other early albums, Led Zeppelin III's reputation has recovered considerably with the passage of time. The RIAA certified the album 2× platinum in 1990, and 6× platinum in 1999. Led Zeppelin III's original vinyl edition was packaged in a gatefold sleeve with an innovative cover, designed by Zacron, a multi-media artist whom Jimmy Page had met in 1963 whilst Zacron was a student at Kingston College of Art. Zacron had recently resigned a lectureship at Leeds Polytechnic to found Zacron Studios, and in 1970 Page contacted him and asked him to design the third album's cover. The cover and interior gatefold art consisted of a surreal collection of seemingly random images on a white background, many of them connected thematically with flight or aviation (as in 'Zeppelin'). Behind the front cover was a rotatable laminated card disc, or volvelle, covered with more images, including photos of the band members, which showed through holes in the cover. Moving an image into place behind one hole would usually bring one or two others into place behind other holes. This could not be replicated on a conventional cassette or CD cover, but there have been Japanese and British CDs packaged in miniature versions of the original sleeve. In France this album was released with a different album cover, simply showing a photo of the four band members. The concept of a volvelle, based on crop rotation charts, was initially Jimmy Page's idea. However, the result was a meeting of minds as Zacron had been working on rotating graphics from 1965. Zacron felt that by not including text on the front of the cover, the art would endure. In an article featured in the December 2007 issue of Classic Rock magazine, Zacron claimed that upon his completion of the artwork, Jimmy Page telephoned him while he was in New York to express his satisfaction with the results, saying 'I think it is fantastic'. 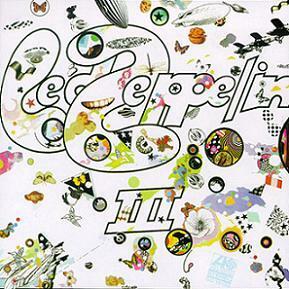 The album cover featured on the front page of The Daily Mail's Live Magazine in December 2007, which hailed Led Zeppelin III as 'The greatest rock album of all time. ↑ Lewis, Dave (2012). Led Zeppelin: From a Whisper to a Scream. London: Omnibus Press, 38. ISBN 978-1-78038-547-1. ↑ Welch, Chris (1996). “Stairway to Heaven”, Led Zeppelin. London: Carlton Books, 52. ISBN 978-1-85868-271-6. ↑ Schulps, Dave (October 1977). "Jimmy Page: The Trouser Press Interview". Trouser Press 4 (22). ISSN 0164-1883. ↑ Lewis, Dave (2012). Led Zeppelin: From a Whisper to a Scream. London: Omnibus Press, 39. ISBN 978-1-78038-547-1. ↑ Lewis, Dave (2012). Led Zeppelin: From a Whisper to a Scream. London: Omnibus Press, 37. ISBN 978-1-78038-547-1. ↑ Lewis, Dave (2012). Led Zeppelin: From a Whisper to a Scream. London: Omnibus Press, 40. ISBN 978-1-78038-547-1. ↑ Grant, Peter. "I II III Than you for making us the World's No. 1 Band", Melody Maker, IPC Media, 19 September 1970. Retrieved on 13 April 2014. ↑ The Top 40 Albums 1970. rocklistmusic.co.uk. Retrieved on 2009-02-10. ↑ The 100 Greatest Albums Ever Made - January 1996. Mojo. Retrieved on 2009-02-10. ↑ Virgin All-Time Album Top 1000 List - 1998. Virgin. Retrieved on 2009-02-10. ↑ 50 Best British Albums Ever - July 2004. Q. Retrieved on 2009-02-10. ↑ Dimery, Robert (2006). 1001 Albums You Must Hear Before You Die. Universe Publishing, 156. ISBN 978-0-7893-1371-3. ↑ Classic Rock - 100 Greatest British Rock Album Ever - April 2006. Classic Rock. Retrieved on 2009-02-10. ↑ Top 20 Singles - 25 October 1970. norwegiancharts.com. Retrieved on 2009-01-19. ↑ The Billboard 200 - 31 October 1970. Billboard. Retrieved on 2009-01-19. ↑ Top 100 Albums - 7 November 1970. chartstats.com. Retrieved on 2009-01-19. ↑ RPM Albums Chart - 7 November 1970. RPM. Retrieved on 2009-01-19. ↑ Top 100 Albums - 11 November 1970. Oricon. Retrieved on 2009-01-19. ↑ Top Pop Albums - 14 November 1970. Record World. Retrieved on 2009-01-19. ↑ Top 100 Albums - 21 November 1970. Cash Box. Retrieved on 2009-01-19. ↑ Top 100 Albums - November 1970. charts-surfer.de. Retrieved on 2009-01-19. ↑ Top 100 Albums - 12 December 1970. PROMUSICAE. Retrieved on 2009-01-19. ↑ Top 100 Albums - 1970. infodisc.fr. Retrieved on 2009-01-19. ↑ Top 20 Albums - 23 January 1971. Go Set. Retrieved on 2009-01-19. ↑ Top 40 Albums - 4 June 2014. Official Charts Company. Retrieved on 5 June 2014. ↑ Hot 100 Singles - 30 January 1971. Billboard. Retrieved on 2009-01-19. ↑ Swiss Charts Certifications: Led Zeppelin III - 1993. swisscharts.com. Retrieved on 2009-01-19. ↑ Bundesverband Musikindustrie: Led Zeppelin III - 1994. musikindustrie.de. Retrieved on 2009-01-19. ↑ RIAA.org Led Zeppelin III - 3 May 1999. RIAA. Retrieved on 2009-01-19. ↑ Disque en France: Led Zeppelin III - 18 October 2001. SNEP. Retrieved on 2009-01-19. ↑ PROMUSICAE Led Zeppelin III - 2002. PROMUSICAE. Retrieved on 2009-01-19. ↑ CAPIF: Led Zeppelin - 2003. CAPIF. Retrieved on 2009-01-19. ↑ ARIA Album Accreditations - 31 December 2006. ARIA. Retrieved on 2009-01-19. ↑ NVPI: Led Zeppelin III - 2006. NVPI. Retrieved on 2009-01-19. This page was last modified 15:19, 12 June 2014.